in the process of making my first braided rug, i discovered that harris tweed worked fantastically as part of it, and pondered the idea of making one exclusively from harris tweeds. with christmas that year coming up, the opportunity was ripe, and i went ahead and did so, and it turned out fantastic! it was really warm-looking, cause harris tweeds are usually in nice earthy tones. the heavy weight of the tweed made for a nice thick, cushy rug as well, and durable, to boot. so of course ive now decided to forget about dealing with other wool fabrics for braided rugs (at least for the most part) and braid with harris tweed only. it really turned out that well. 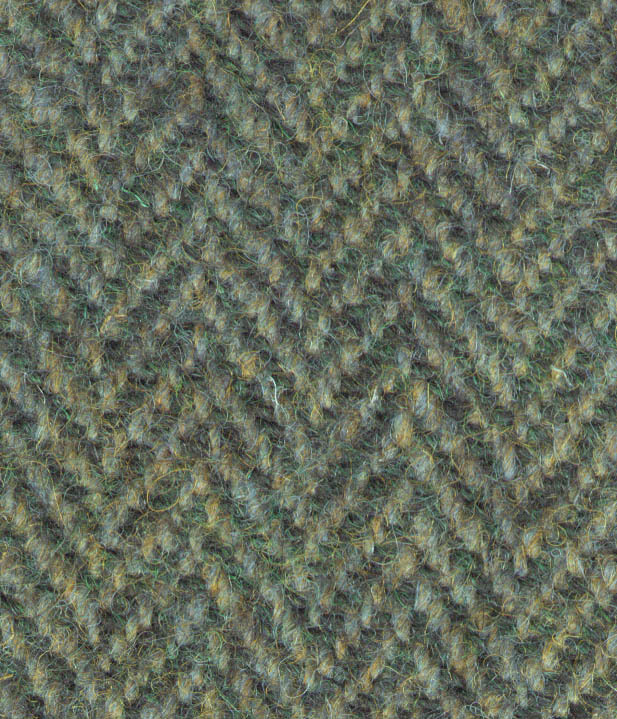 harris tweed (at least the stuff used in the sportscoats that i get mine from) may be a heavy, itchy wool, but you dont notice that in a rug (and heavy is actually an asset!). the coarseness of the weave and the minute varigation that is a trademark of the fabric make it all the more appealling. ive tried some other tweeds, not harris, from other sportscoats - ones that feel the same in the coat - but seriously, theyre just not the same. i dont know what it is, but theres just something different about it. my first harris tweed braided rug, made for my mom, christmas 2003. this is the one that convinced me that i should specialize in braiding rugs with this material. ended up in front of the woodstove, an ideal application, cause its heavy enough to deal with the wear and tear of constant use, and because of the natural fire-retardancy of wool. oh yeah, and it looks good too. not the greatest photo - in real life the blues and browns are, well, bluer and browner. ok, im hooked. 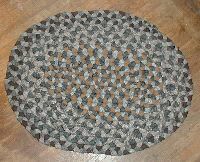 im starting to collect tweed for a second rug - this ones going to be a runner of sorts, about 5-6' x 2'. itll need about twice the material of the rug above, so about 18 coats. im considering covering a lot of my room floor with braided rugs, overlapping in the manner of persian rugs - whats ive been referring to as the "persian prairie" look :). 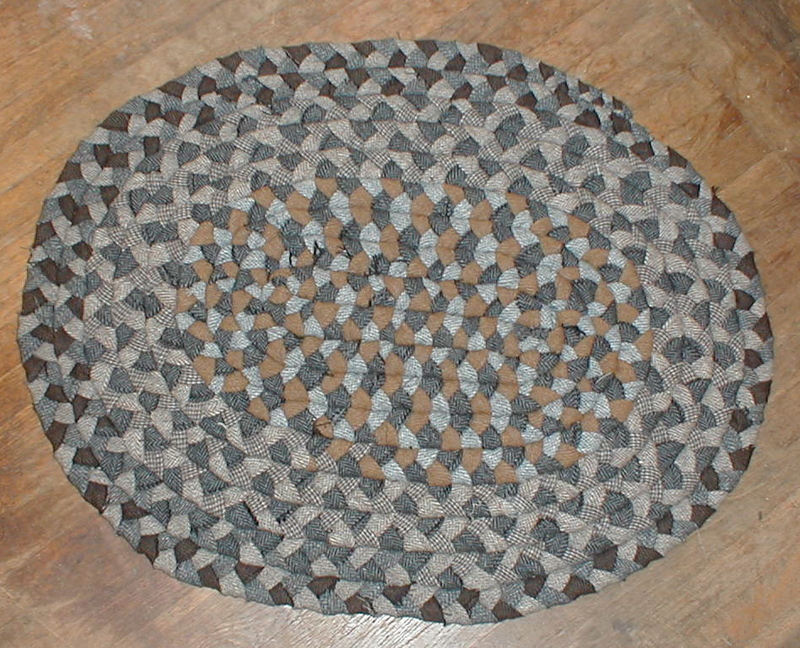 could get pretty thick after a while, but its a good way to deal with making more rugs than i actually have space for.